2. The Lake Maintenance Commission met on February 9th to discuss the resumption of dredging in Spring 2015. Topics included having the dredging contractor prepare a plan / schedule on how they propose to conduct dredging to minimize lake user conflicts in the 2015 dredging season; and to identify miscellaneous maintenance activities needed to resume dredging. 3. 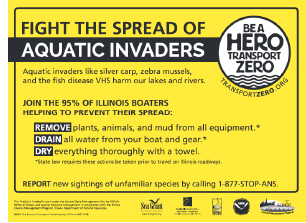 One of the largest threats to inland lakes is the transport and introduction of invasive species from boat trailers. The MPOA is planning on ordering informational signs (>>) for installation at all subdivision boat ramps this spring. 4. All winter lake user’s are again reminded of the presence of the rip-rap island protection around O’Brien Shoals and Wickline Island, as well as the dredging equipment and pipeline in the West Bay, and as always, are urged to use caution in these areas of the lake. 5. The Illinois Lake Management Association annual conference will be held February 19 - 21, 2015 at Northern Illinois University in DeKalb. MPOA Directors and Members are strongly encouraged to attend, as a wide variety of lake topics are covered. Information can be found at www.ilma-lakes.org. 6. The 3rd Annual Fox River Summit will be held on Friday, March 20th, 2015 from 7:30 am to 4:30 pm at the Veteran’s Terrace, Burlington, WI. I will be giving a presentation on Nippersink stream restoration projects. Registration info at http://www.sewfrc.org/summit/ 7. The Northeast Illinois Invasive Plant Partnership will be holding a workshop on invasive plants on Tuesday, May 9th from 6 to 9 pm at the McHenry County Conservation District, Lost Valley Visitor Center.